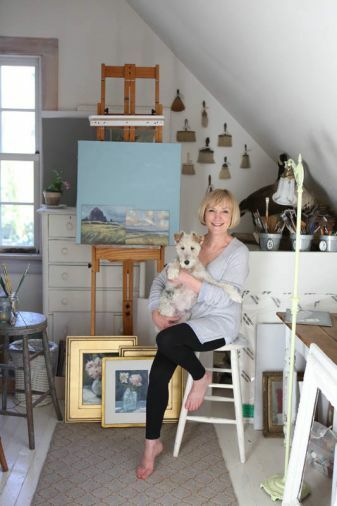 Diane in her upstairs studio with their fox terrier Lily. 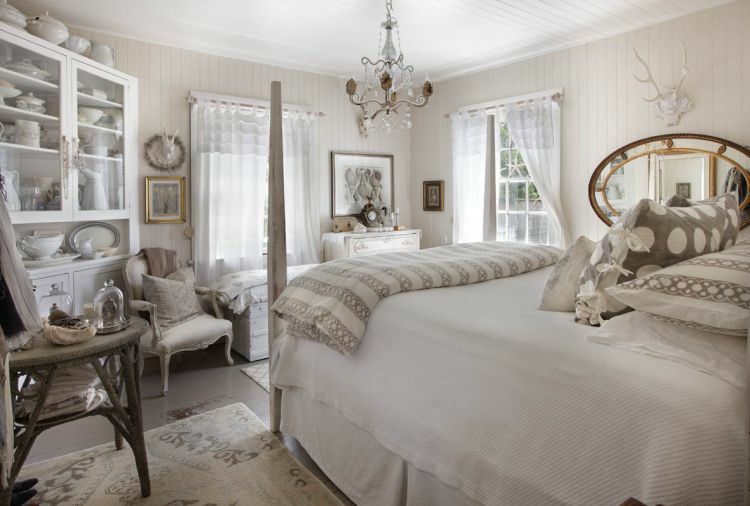 “I love anything French,” says Diane of her reproduction French twin beds dressed with pleated, ruffled duvet and shams. Throw pillows by Les Indiennes are hand-dyed with vegetable dyes and block printed. A French bedside table sports original paint; antique books and an antique plaster angel shine beneath an Aidan Grey lamp. All items can be found at Sesame + Lilies. Jay, Diane, Rachel and Lily gather on the porch, formerly a typical wraparound style until previous owners enclosed it as part of the living area. 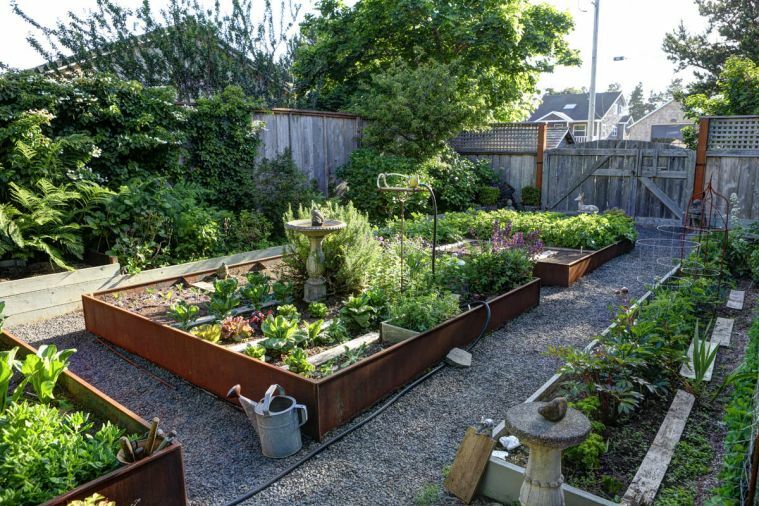 Jay built the garden beds from steel 18 years ago; they have held up well in the rugged ocean climate. 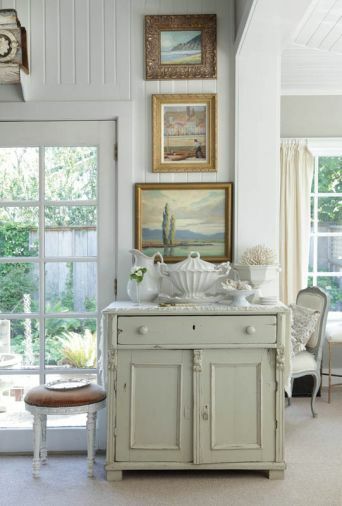 Diane purchased this antique pie safe with original paint from another dealer who found it tucked away in a barn on an Oregon farm. “We had to trim the legs slightly because of water damage,” she says. The wooden shoe form display was collected by Diane and Jay’s grandmother. A former owner added the built-in bookcases which showcase the family’s growing collection of antique encyclopedias, dating as far back as 1840. An unusual Scandinavian table purchased 15 years ago would be difficult to find now. The antique Danish landscape painting with cows was purchased locally. “The couple were Danish importers who had relocated from Seattle.” A hand caned settee hails from France. Glass candlesticks are a favorite decorating item of Diane’s, especially in summer. “I’m always looking for light colored antique Anatolian rugs,” says Diane of the Turkish rugs found in the bedroom, kitchen and dining area. A 1920s American easy chair upholstered in the same Les Indiennes fabric as the occasional pillows gets a bit of pop from a polka-dot pillow by the same manufacturer. The couple changed out all of the lighting in the house, including this reproduction of a French beaded crystal chandelier. Knob and tube wiring is original. 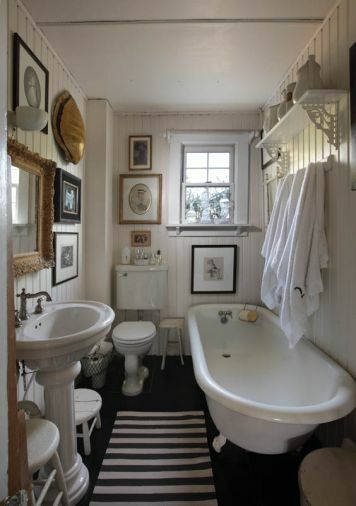 A collection of objets d’art, family artwork and photos invites one to loll a while in the original clawfoot tub in the downstairs bath. An antique turtle shell, likely harvested for its protective plates, hangs above Diane’s painting of their late dog Lucy. Her mother’s wedding picture and maternal grandmother’s watercolor add to the collection. 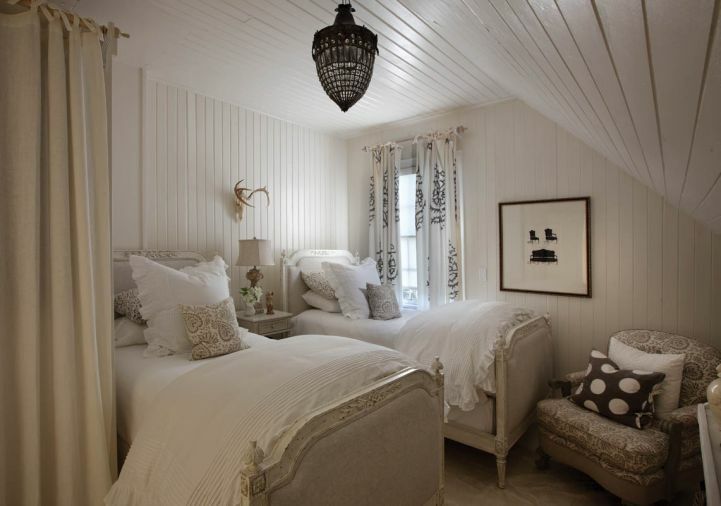 Relaxing shades of white, off-white and soft grays make the master bedroom a soothing retreat. 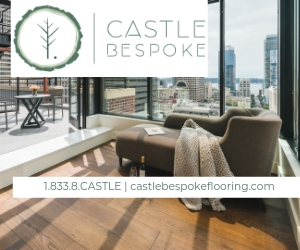 The antique sea grass table reiterates the painted warm gray fir floors. V-groove walls and ceilings are original, and repainted. Bedding is from Sesame + Lilies. Jay installed French doors that lead to the garden at left. Diane’s painting of Neahkahnie Head tops another painting by Jay’s great uncle and a California plein air painting of Salinas Valley. A Redcliffe ironstone tureen resembling a sea shell sits atop an antique Romanian chest. Ever since Diane and Jay Speakman, owners of Sesame + Lilies, the Art of Interiors, in Cannon Beach, met and married in Santa Fe, New Mexico, their union has been graced by the presence of art, antiques and a passion for historic architecture. Raised in New England, except for three years spent in Beirut, Jay attended college in Hawaii, before returning to Maine, where he had spent childhood summers to pursue a lobstering career. As an adult, he worked on freighters and yachts, and fished commercially in British Columbia and Alaska. Later, an apprenticeship with a wellknown blacksmith led him to the Southwest, where he was sculpting in copper when he met Diane. A native of Houston, Texas, she was running a bed and breakfast in Santa Fe, and working as a graphic artist and illustrator when they met. Seeking coastal life once more, Diane and Jay moved to Gearhart, Oregon, where one house in particular caught their fancy. Built by Marshall Kinney, an entrepreneur who ran a successful cannery business and sawmill in Astoria, it had the same architectural vernacular as many of the houses on the Maine Coast. Drawn to its high ceilings, multi-paned windows, large dormer, cedar shingles and white trim, the couple purchased it and moved in with their daughter Lauren in the summer of 1996, when Diane was pregnant with their second daughter Rachel. Gearhart Park, the first coastal resort community in Oregon, was conceived by Kinney and his wife Narcissa, who envisioned it as a “wilderness” playground for “culturally elite” Portlanders seeking fresh sea air, picnics on the dune meadows, and cozy beach cottages set amidst “virgin forests.” It is said that Kinney despoiled his own vision when he transformed the previously “untouchable” dunes to the West into a 9-hole golf course in early 1900. By 1905, the town, known for its perambulating east-west Ridge Path, estuary, Neacoxie Creek, dunes and ocean, expanded westward under the ownership of Theodore Kruse. A century later, the beach cottage the Speakmans bought appeared to be in good shape, cosmetically speaking. Structurally, however, it had problems of biblical proportions. The house, as was common at the time, was built upon sand on posts and piers without a proper foundation. “Every one who had owned it previously had cobbled a basement together,” recalls Diane. Prior to creating a full daylight, earthquake-proof basement with 8’ ceilings and a concrete foundation that now houses their office, antique repair shop, art metal studio and music room, the Speakmans added: a new roof, insulation, modern plumbing and windows and upgraded the electrical system. Exposed 1920s wiring was replaced, while functioning knob and tube wiring to the attic remains. She admires Kinney’s choice of location and the placement of the house. 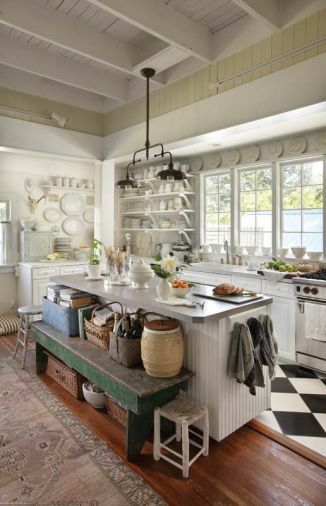 “The sun pours into the kitchen in the morning,” she says, “and it sets in the living room in the evening. 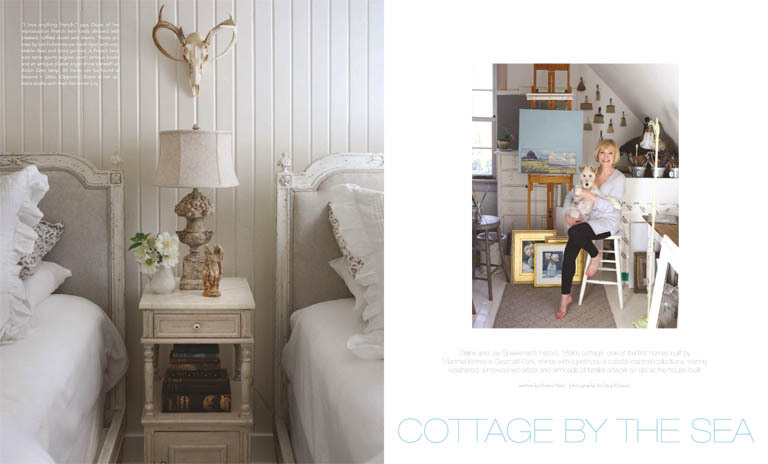 We see this same placement in a lot of houses built along the coast in Maine, where we have a log cabin that Jay built on Little Cranberry Island in his twenties.” The Speakmans also maintain a small cottage in Southwest Harbor, which has been in Jay’s family since the 1880s. 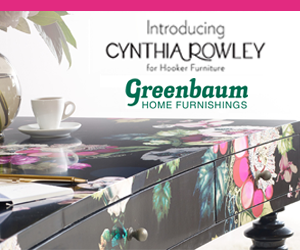 In addition to owning a shop, Diane also acts as an interior designer for clients’ homes. 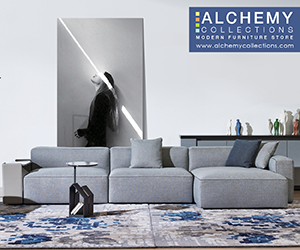 With their design, she always begins with a vision, bounded by the clients’ budget and time frame. In her own home, the process is quite different. “Antique dealers are always antique dealers’ best customers,” she says. “When you’re an antique dealer, artist and collector with a lot of stuff, you find homes for things,” she says, laughing at her own weakness for such irresistible antiques as iron-stone, glass and turn-of-the-century oil paintings. She says her paintings have a certain color palette that she favors which is reminiscent of antique European landscapes. Those clients who respond to her palette will usually buy more than one painting. Many in Jay’s family were artists. Both his father and grandmother painted, as did his great uncle, Walter Willoughby, who studied painting in France after World War I. The master bedroom features Jay’s father’s watercolor of a vase of water lilies from the moat at the temple of Angkor Wat in 1930s Cambodia. Its gilded frame ties to one of the couple’s favorite new acquisitions: an 18th c. French oval mirror with fleur de lys gilded plaster adornments. 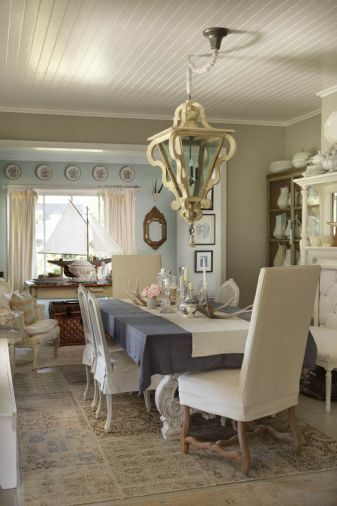 As her style has evolved, Diane has chosen to downplay some of the Victorian elements of her décor, including the dining room mantel piece that was painted light pink when she salvaged it from another Gearhart home. Today, a large reproduction wooden lantern chandelier offsets the Victorian mantel. 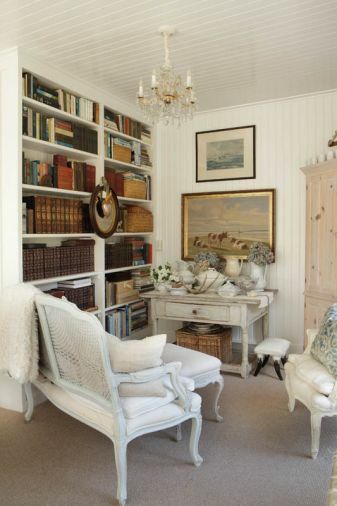 Oversized end chairs balance with Jay’s early 20th c. pond model in the adjacent room. 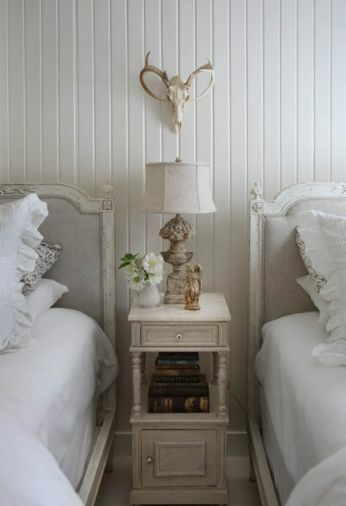 Memories of Santa Fe are found the bleached deer skulls scattered throughout the home. As a shop owner and antique dealer since she was 13, buying on both coasts, Diane keeps a keen eye on which items are valued in each location. She has watched many trends come and go, but believes that demand for quality antiques has never waned among those who appreciate them, although certain antiques are now harder to find. Jay’s carpentry, sculpting and fine art skills contribute to Diane’s look. An apprenticeship to a cabinet maker on Maui, three summers spent at the Haystack Mountain School of Crafts in Maine, and more than a dozen years as an architectural blacksmith have served him well. In the kitchen, the Speakmans added black and white tile flooring and removed all the MDF trim, replacing it with clear vertical grain fir. 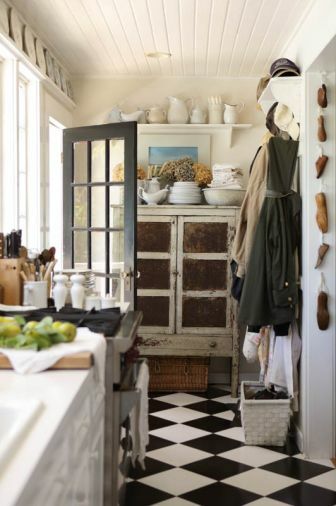 “Then, as purists,” he says, “we painted it.” They also designed the plate rack above the windows and built open shelves from five-quarter pine, which feature elegant, stair-stepped knee braces. Recent high school graduate, daughter Rachel, who was born in the house and has inherited some of her parents’ multi-talents, painted murals and worked as art editor on the high school newspaper. “She has been granted a scholarship to attend the School of the Art Institute of Chicago this fall,” says Diane. College graduate daughter Lauren, who grew up working in the shop, has embarked on a career of her own in Southern California, and helps Diane with certain aspects of the business as a fashion consultant. One precious moment of their near 20-year stewardship of the Kinney home came when a woman from Boise, Idaho, knocked on their door, showing them 1911 pictures of her grandmother standing in front of their house that her grandfather, John Kirby, a lumberman and owner of Ross Island, purchased from Marshall Kinney. 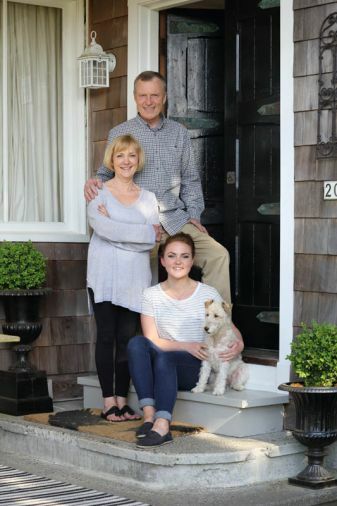 Unlike Kinney, Diane and Jay have no intention of ever selling this historic vintage beach cottage they call home.